Hello and Happy Tuesday! 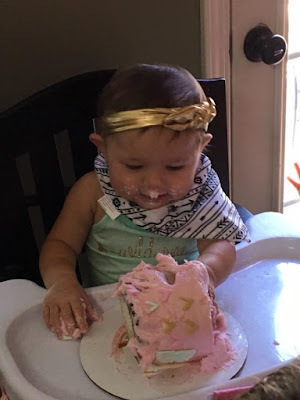 We had a wonderful weekend at my sweet Granddaughter's 1st Birthday Party! Blakely just dove into that cake and once she realized no one was going to stop her.. she just kept right on with it. lol She had frosting from one end to the other before she I finished! Hilarious! 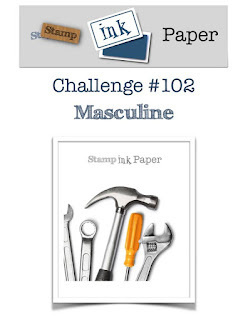 Since today is Tuesday, it is time for another Stamp, Ink, Paper challenge. 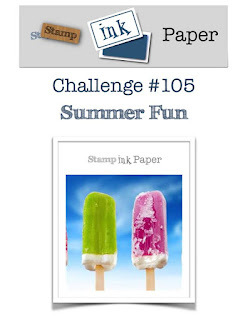 This week's Challenge is a Summer Fun theme. There are so many possibilities! 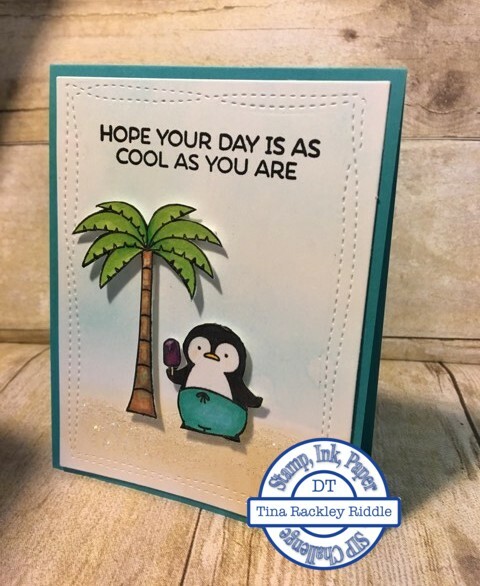 I decided to play with a MFTStamps set called Penguin Paradise. For my background I did a little light ink blending on a piece of 110# Neenah Classic Crest Solar White Cardstock. I used Avery Elle Wonky Rectangle Dies to cut my panel out after blending. My sentiment was stamped with Memento Tuxedo Black Ink onto the blended base. My penguin and tree were stamped on more of the Crest Solar White cardstock with Memento Tuxedo Black and I used various copic markers to color in my images. I used FSJ foam adhesive squares in Medium and small to adhere it and used my scissors to cut some of the squares so that all of the parts were adhered well. I brushed some FSJ craft glue onto the sandy portion and used some FSJ Sparkle Dust to give some sparkly shine to my sand. This one was super easy and turned out really cute! Hello and Happy Tuesday! I hope you had a wonderful Father's Day weekend! 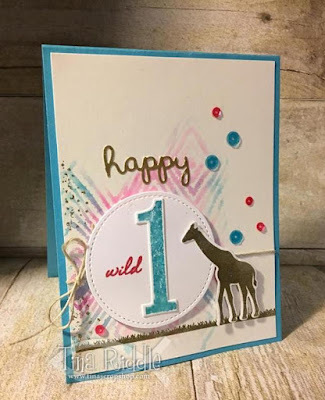 The card that I'm sharing for the Stamp, Ink, Paper Color Challenge this week is actually the card that I gave my sweet hubby for Father's Day! I was a little stumped with the colors at first but then I thought.. flowers! You can pretty much make any colors work with flowers! Jeff has worked so hard the last few years with our landscaping and flowers so I thought this card was perfect for him! Actually Jeff and I just looked at some window boxes and deck boxes so I thought I'd pull out my brand new Concord & 9th Petals and Pallets Bundle and make a crate of flowers using the required colors in this week's challenge (SU Berry Burst, Lemon Lime Twist and Island Indigo). I have to tell you that I saw the Concord & 9th video for this new bundle the night before it was released and I stalked their website until it was available! I was afraid it would sell out if I didn't get it right away! 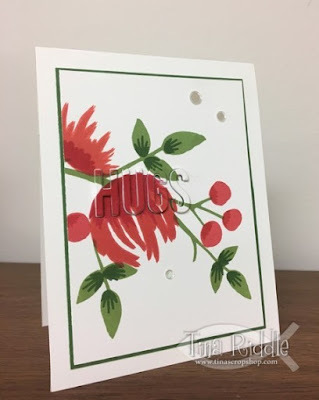 For this card I started with an 11" x 4 1/4" piece of 110# Neenah Classic Crest Solar White Cardstock that was scored at 5 1/2 for a top folding card. I used the new SU Embossing Paste mixed with a drop of Crumb Cake reinker and the Brick Decorative Mask to make my background. The wooden planks were stamped on Crumb Cake Cardstock with Soft Suede Ink. After cutting out my crate I added the dove tail stamp for the corners and scored my cardstock to glue the back to my cardfront. I stamped the flowers from the Stamp Set in Berry Burst and Island Indigo and my leaves in Lemon Lime Twist and cut them all out with the coordinating dies. I also cut out a couple of fern leaves from the retired SU Botanical Builders Stamp Set. I used the Lawn Fawn "happy" die to cut out Gold Foil Cardstock and adhered to the front of the crate. The I'm with you sentiment is from the Mama Elephant Organic Blooms Stamp Set. 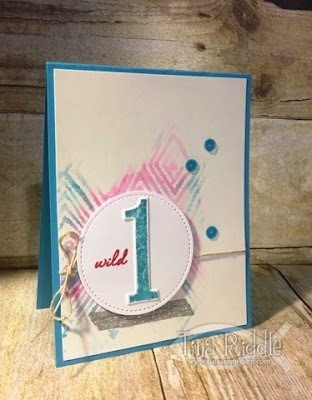 I stamped it with SU Berry Burst Ink onto white cardstock and cut it out with scissor and then adhered with tear tape. Last but never least, I added three gold Pretty Pink Posh Sequins. Hi friends. This is one of those rare just for fun posts. I made a card yesterday that I loved and wanted to share it. So super fun to make. I started with a 11" x 4 1/4" piece of 110# Neenah Classic Crest Solar White Cardstock scored at 5 1/2" for a top folding card. I added a 5" x 3 3/4" piece of SU Garden Green Cardstock. I used the awesome Flourish Stamp Set from Concord & 9th and my Misti to stamp the floral images onto a piece of 4 7/8" x 3 5/8" piece of 110# Neenah Classic Crest Solar White Cardstock. The Inks I used to Stamp my Image were Watermelon Wonder, Real Red, Wild Wasabi and Garden Green inks from Stampin' Up! I used the "Hugs" die from MFTStamps Words for Friends set to cut out the word from the image. After cutting out the word, I saved the letters cut out and then added the stamped layer to my Garden Green layer with Fast Fuse Adhesive. I then cut out the Hugs word from White Fun Foam and added it to the negative space with Tombow Multipurpose Glue and then glued the letters that I cut out from the Image onto the Fun to foam. I added three Pretty Pink Posh Clear Sparkling Confetti Sequins to finish this one off. I absolutely LOVE how it turned out! One of my favorite cards I've made in a while. I hope you love it too! Hello and Happy Hump Day! This week is going super duper fast for me because I get to see my Daughter and Granddaughters in just 2 days! Yay for me! It will be a busy weekend. Friday is my birthday and Saturday my daughter and I will be throwing a baby shower for Wayne and Ashleigh. Then of course Sunday is Father's Day. That's a lot of action in just three days! 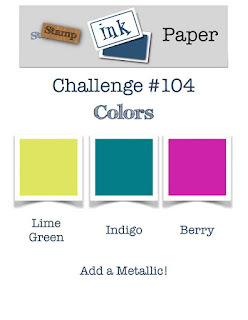 lol Well since today is Wednesday it's time for another Paper Craft Crew Challenge. 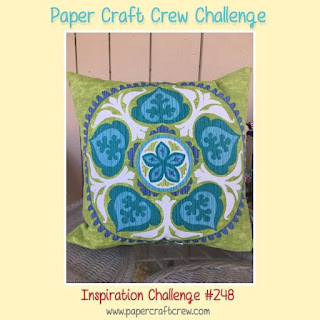 This week's challenge is an Inspiration Challenge! So first of all, I wanted my rose blue since the flower in the Inspiration Picture is blue. 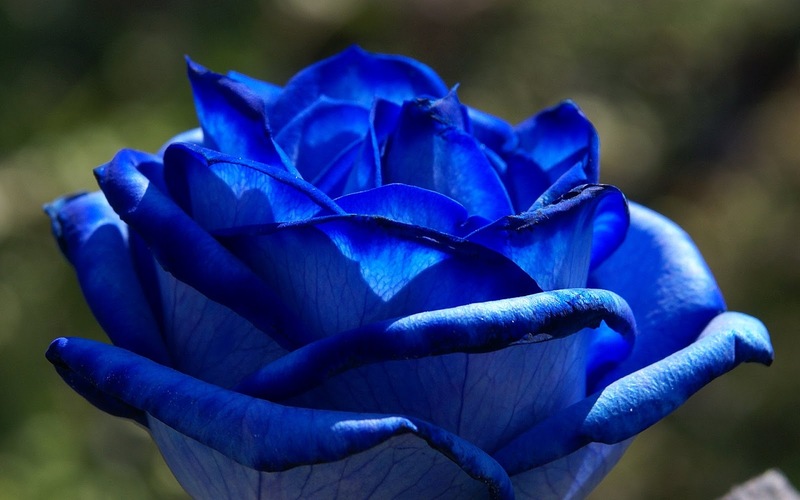 Did you know that there are blue roses! Well I googled it and yep, there are! 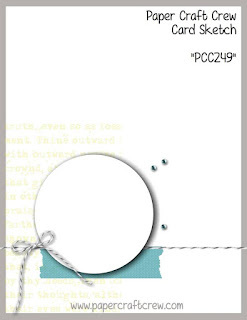 The gorgeous background from the Reflection Paper Pack was cut with Lil' Inker Designs Stitched Rectangle dies. I backed it with a skinny layer of SU Island Indigo cardstock. To me the lightest green in the Inspiration picture was almost a yellowish-green so I used FSJ Sweet Pear and Electric Lime for the leaves and stem with a touch of SU Wild Wasabi at the bottom of the stem. 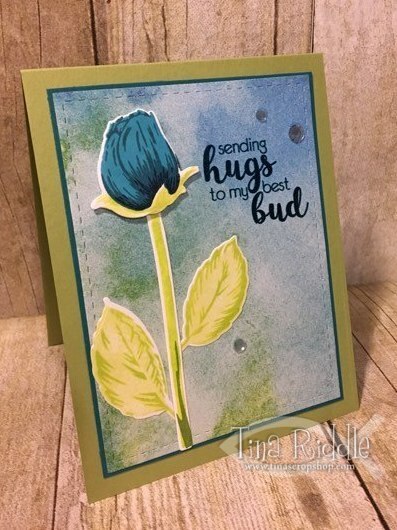 The bud was stamped with SU Tempting Turquoise and SU Island Indigo. The sentiment was first inked with Versamark and then SU Island Indigo and then heat embossed with clear embossing powder. I added three of the Pretty Pink Posh Sparkling Confetti Sequins to finish off my front. I added the matted front panel to a 11" x 4 1/4" piece of FSJ Lemongrass Cardstock that was scored at 5 1/2" for a top folding card. It's simple but I think super pretty. Hello friends! Hope you are having a wonderful week! 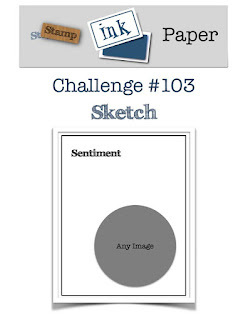 I'm over at Stamp, Ink, Paper with my Design Team card for a new sketch challenge. This is a super easy sketch... you'll love it! 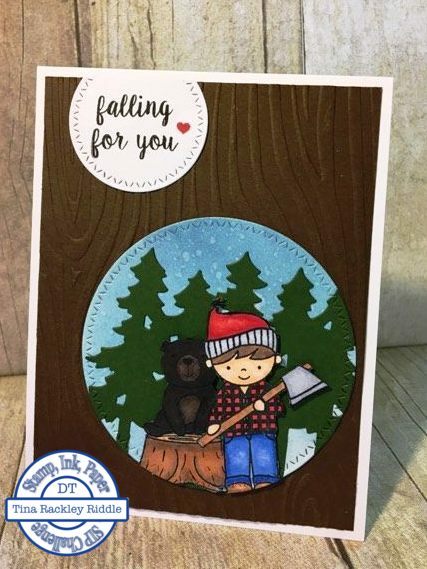 I decided to use a fun Neat & Tangled Stamp set called Lumberjack Love! I think I'll be getting a lot of use out of this one since I have a grandson on the way. His Mom and Dad have chosen a Lumberjack Nursery theme! Now first I have to admit, I am NOT an expert copic colorist but I did my best with this one. My copic supply is very limited. Note to self: I definitely need more browns and blacks! lol But all in all I felt like my little lumberjack was super cute. Now my grandson's nusery will have black bears and since I had no black copics, I used the two browns I had and just did the best I could. Hello and Happy Tuesday! How's your week going so far? We've had lots of rain over the weekend but at least it has cooled it off just a bit. On Saturday, my hubby and I went to Knoxville to watch my sweet granddaughter Taylor play softball! She is only 7 and is really doing so well. It fun to watch how much she's progressed just over the last couple of years. Well since today is Tuesday, it's time for another SIP Challenge! Today is all about Masculine Cards! With Father's Day coming up, this should be a popular challenge! I was able to purchase the coordinating dies for Traveler from Dies by Dave a while back. I am so glad I did. I have fussy cut this train so many times and it sure is wonderful to have the die! For this fun card I started with an 11" x 4 1/4" piece of SU Basic Black cardstock scored at 5 1/2" for a top folding card. I added a piece of 4" x 5 1/4" corrugated cardstock from my stash with fast fuse. I slanted it a bit to the left side. My top layer is a 3 3/4" x 5" piece of #80 Neenah Classic Crest Solar White cardstock. I stamped the world map stamp with Sahara Sand SU Ink. I used some SU Crumb Cake Ink to ink the edges. 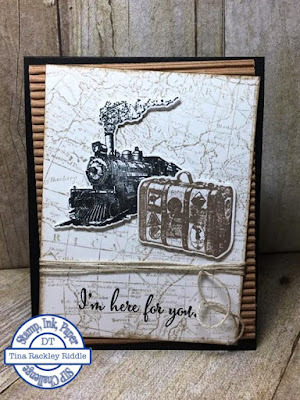 I stamped the train with FSJ Black Licorice Ink and the suitcase with SU Soft Suede Ink. I used the dies from Dies by Dave to cut the images out and popped them up with 3M Foam Tape. I stamped the "Im here for you" sentiment from the SU You've Got This stamp set with FSJ Black Licorice Ink. I added some FSJ Natural Twine and then added this layer scued to the right with Fast Fuse. I used the edge of my scissors to add a bit of curl to my twine to finish this one off. 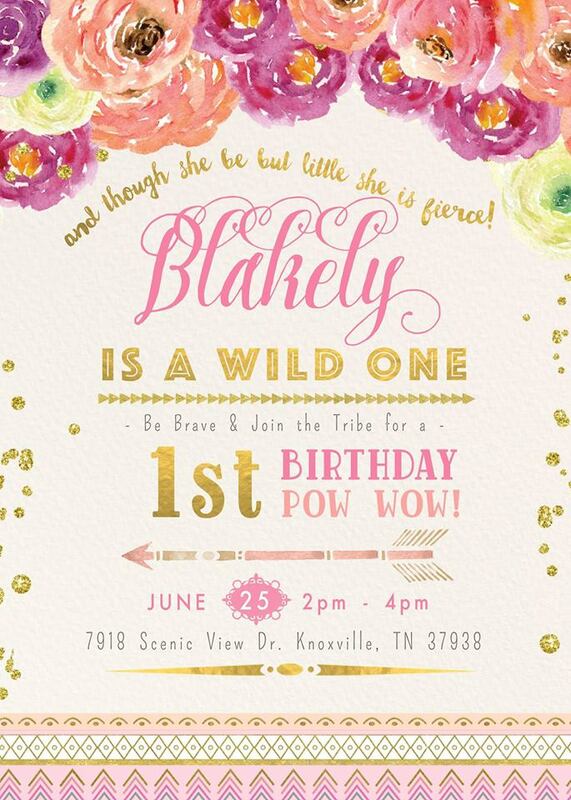 Simple card but super cute I think!